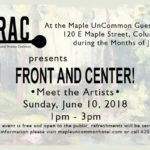 JRAC presents Front and Center at the Maple UnCommon Guest House & Gallery. 120 E Maple Street, Columbus KS during the months of June & July. The even is free and open to the public, refreshments will be served.